So who wrote the stylish, reasonably thorough, and only slightly skewed profile on MSNBC's Open Channel, dedicated to "investigative reporting by NBC News," headlined Meet the NBA tycoon and rapper's friend who could be president of Russia. One Robert Windrem, described as a senior investigative producer for NBC News and a Nets season ticket holder. Who is Mikhail Prokhorov? That’s easy. He is the most interesting man in the world! 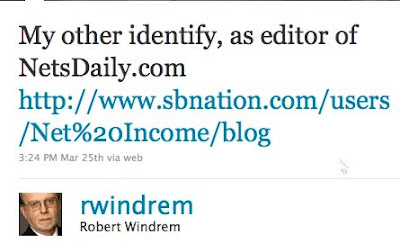 Windrem doesn't like to reveal that identity--remember how, in the 10/31/10 New York Times Magazine, he was described as "a 65-year-old New York-based television producer anxious to keep his old- and new-media identities separate"? But he's revealed himself in hints and in his own 3/25/10 tweet, shown at left. In his distinguished professional career, Windrem's covered everything from international terrorism to nuclear proliferation, mainly for NBC News. Now he's also a Research Fellow at the NYU Center on Law and Security. He owns an NBA team – the New Jersey Nets -- and part of a billion-dollar arena being built in Brooklyn. His business partner in both is the rapper and entrepreneur Jay-Z. He’s received medals from the presidents of Russia and France and met U.S. Presidents George W. Bush and Barack Obama, the latter of whom suggested he’d like to play with Prokhorov in any pickup basketball game. Actually, his main business partner is Bruce Ratner, CEO of Forest City Ratner. Ratner faced a Dec. 31 deadline to sell $500 million in federally guaranteed bonds to build the Nets’ arena, to be called Barclays Center. The bonds are tax-exempt, but not federally guaranteed. I have met numerous people associated with the Nets, all the way up to the Big Russian and Ratner. They respect the site and have asked to meet with me. Shouldn't that, as well as Windrem's role as site editor, been mentioned? After all, if, as Windrem writes today, Prokhorov's "reception from long-suffering fans long-suffering bordered on obeisance," Net Income surely had a role. Isn't it odd that Bobbo, Windrem and Net Income have never been seen together and that none of the 3 chose to post a link to the MSNBC article that all three wrote on their Netsdaily blog? Seems like one or two of them has a keen interest on hiding the other's existence. I've worked with bob for decades and he does not (and did not) pull punches. As a Knicks fan I care little for the Nets. But don't be unreasonable - without Windrem coverage would be left to rookie NJ hacks and the boosterism factory of Espn. He does more than not pull punches. Under his pseudonym he writes things he'd never put his name ot.